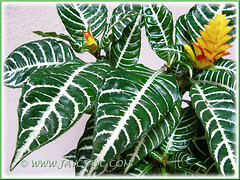 Indeed, Zebra Plant is one of the most spectacular of tropical plants, too gorgeous to resist! Can be grown outdoors or as a houseplant. The bright ivory veining really sparkles in beautiful contrast against the dark green leaves, making it so desirable as an ornamental plant. Not to be side-lined are the vibrant yellow-coloured flowering spikes that will be showing off for several months. We weren’t surprised at all when a lovely pot of three plants hopped into our car when we went plant-shopping last March. Its remarkable beauty must have clouded our memory because we’ve forgotten that our love affair with Aphelandra squarrosa about a decade ago had ended up a total flop. Sadly, history repeated itself and we lost it after one and a half months. Subsequently, we got another pot in May on impulse as it was too eye-catchy and seductive. It did thrive beautifully in the ground for several months. However, without warning about a week ago, the plants started to flop and went downhill speedily. Probably it died due to the frequent heavy downpour since early September. I’ve just dug up its remains and observed that the soil was too moisture-retentive… maybe this was one of the causes too. Let not our failure deter you from growing this dramatic beauty! Let your gardening expertise shine! Origin: Native to the Brazil. 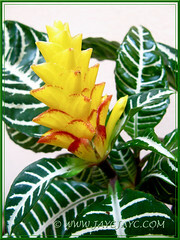 Plant type: An ornamental tropical perennial. 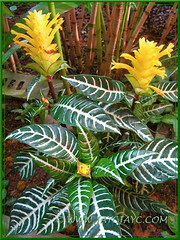 Features: Aphelandra squarrosa is an attractive species of the genus, Aphelandra that originates from the tropical forest of Brazil. 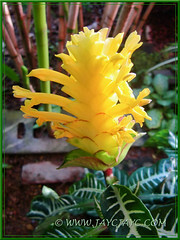 A moderate-growing herbaceous plant that grows between 0.5 – 1 m (1.5 – 3 ft) tall and somewhat compact in cultivation. However, in its native tropical habitat in Brazil, it can soar up to 2 m in height and spreads to about 1.5 m. An upright herb that becomes leggy with age but can be bushy if well-pruned. 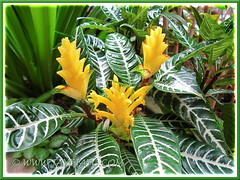 Its evergreen foliage is stunningly striking! The large, deep green and glossy leaves are beautifully filled with distinctive ivory or silvery-white veins, resembling a zebra. Hence aptly and fondly called the Zebra Plant. Leaves that sprout from the purple-tinged brown stems are long, elliptical to ovate with pointed ends and the blades somewhat wrinkled. Its other attraction are the highly decorative and colourful, terminal yellow inflorescences that it produces. Rising above the foliage are cone-shaped clusters of brightly yellow and waxy bracts with small tubular blooms growing on the sides. These showy yellow clusters can last for many weeks and are a sight to behold. Nevertheless, even when not in bloom, the variegated foliage is a stunner! Some of the named cultivars are ‘Louisae’ with yellow bracts that are beautifully tipped with orange-brown markings, while ‘Dania’ is a compact plant, crowned with clusters of bright yellow bracts, and ‘Silver Green’ has paler green leaves with a silvery sheen. Culture (Care): Growing Aphelandra squarrosa can be challenging as it requires a little more care than some other plants. Being a native of the Brazilian rainforest, it appreciates warm temperatures, high humidity and lots of bright, indirect light. Light: Best in a bright and warm location or partial shade with filtered sunlight. Never locate it in direct sunlight that will scorch the leaves. Moisture: Moderate water requirements. Never allow soil to dry out completely at any time. Its extremely sensitive to its water needs – too little, and the plant will wilt and drop leaves, whilst too much, its roots will rot. High humidity is essential. Soil: Benefits from nutrient- or organic-enriched soils. Prefers moist and well drained soils, but never water-logged or soggy. Others: Once flowering is over, remove the fading flowerheads to encourage the growth of side-shoots. Plants become top-heavy with age, so hard-prune leaving a pair of basal leaves, to rejuvenate and groom. Feed every fortnightly with a balanced liquid fertilizer at half-strength. High humidity is most essential to prevent leaf loss and browning of leaf tips/margins. If grown indoors, mist the plant regularly, use a humidifier or place the pot on a shallow pebbled-tray filled with water to just below the base of pot to help raise humidity. Keep indoor plants away from cold drafts and maintain constant normal room temperatures. Repot only if necessary as Zebra Plant prefers to be somewhat pot-bound in a smallish pot. Though generally, pest and disease free, Zebra Plant does attract mealybugs, aphids, scale and spider mites. For subtropical and temperate regions: Hardiness: USDA Zone 11-12. 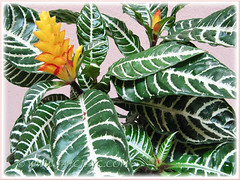 Aphelandra squarrrosa is usually grown as a houseplant in cooler regions. Being a tropical plant, it needs constant warmth and high humidity. Zebra Plant thrives best when the temperature is in the range of 18-21°C (65-70°F). Maintain constant warmth as fluctuations in temperatures may cause leaf loss. Mist it regularly or use a humidifier to increase humidity. Keep soil constantly moist during hot seasons but reduce watering at lower temperatures, allowing the soil surface to dry between each watering to avoid rot. Feed once every two weeks with a balanced liquid fertilizer at half strength when actively growing from spring to summer. Provide sufficient bright light to encourage plants to bloom. However, keep in mind that too much light can cause wrinkled or curled leaves. Propagation: Easily propagated by stem or tip cuttings. Cut just below a leaf joint with a sharp knife and remove the bottom leaves. Stick the stem cutting directly into a well-drained potting mix, firm it, water thoroughly and site the pot at an area with indirect light. Water lightly when the soil appears to dry out. Use a rooting hormone powder for better chances of success. 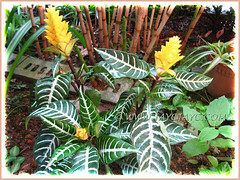 Usage: Aphelandra squarrrosa or Zebra Plant is an excellent choice for that exotic tropical look, both in a container or in the ground. 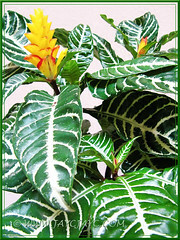 Its fabulous foliage variegation and showy inflorescences makes it an ideal houseplant in brightly lit offices and homes. Outdoors, it provides a year-round interest in garden beds and borders with its spectacular display. As container plants, well-suited to decorate garden porches, decks and patios. My mom once bought this plant & it slowly died. It was expensive for a small pot with 3 plants tightly planted together. I think it could be the over-watering or the root rot that might cause the end of it. She did mentioned that the leaves starts falling out after the flower had spend. And so – I didn’t have a liking of this plant eversince. Strange – now I realise why.